Please welcome our latest reviewer, Arukiyomi. You may notice his button in our sidebar; this links through to a rather nicely put together spreadsheet of all the 1001 Books To Read Before You Die lists. Enjoy, both the review and the spreadsheet. This is an epic in the great tradition of Scandinavian literature. A trilogy which helped to win her the Nobel Prize, Undset’s masterly portrayal of the life of a 13th century nobleman’s daughter is a classic work and should be more widely known. Kristin is a headstrong beauty who spends most of her life torn between her urges (love, guilt, loyalty) and her obligations (family, religion, gender). 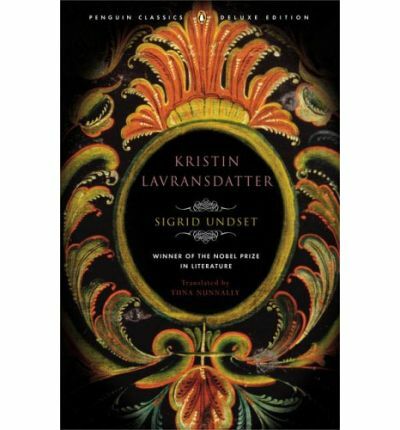 There’s plenty here that occurs in many other great novels but what makes the difference to this work is not only the richness of Undset’s exploration of Kristin’s character, what makes this novel stand out is the setting. I doubt many are familiar with 14th century Norway. Exploring it through Undset’s prose is a very rewarding experience. Granted, there are brief stretches in the second book where the medieval Scandinavian political scene dragged a bit. But these are brief and you’re soon back into the countryside, or houses, or food or clothing or religion and these are all richly described. For me, the blend of superstition and Christianity was fascinating. Why so? Well, it mirrored almost perfectly that of the 21st century Papua New Guinea I’m living in. Made me wonder if the present day church in Norway is what PNG’s will look like in 2800. There are plenty of events along the way that keep you occupied while you get to know the setting and Kristin herself. She has 7 sons and, as they grow up, she finds herself facing somewhat similar issues to those her father faced with her. She deals with these in various ways, always haunted by what she put her parents through. And there are plenty of other characters to keep you busy if you’re not taken with Kristin herself. Her father features a great deal in the first book and he’s something of a hero, both on the domestic and national fronts. Simon is also a key figure in the narrative and his love for Kristin is an entire story in itself. So, if you want to immerse yourself in the past for a while and see both how life has changed while humanity has stayed the same over the last 800 years, get yourself a copy of this. For portability though, I suggest you get the e-book. Alternatively, at 1100 pages, use it to build your biceps on your daily commute.